When United States president Barack Obama in March 2010 introduced an historic $938 billion health care overhaul that guaranteed coverage for 32 million uninsured Americans, Republicans immediately promised to repeal and replace the Act at the earliest opportunity; President Trump tried to do that last week. The Affordable Care Act, nicknamed Obamacare that Trump tried to rollback was expected to touch the lives of nearly every American citizen. Because of his persistence, Obama presided over the biggest shift in U.S. domestic policy since the 1960s. "We are not a nation that scales back its aspirations. We are not a nation that falls prey to doubt or mistrust. We don't fall prey to fear. We are not a nation that does what's easy. That's not who we are. That's not how we got here," Obama said after he signed the Bill. Throughout Obama's presidency, Republicans remained firm in their opposition to this fundamental remake of the US's health system, declaring that it is much too costly and unlikely to produce the results that Obama claimed. Recall that Obama's historic achievement was sealed when the House voted 219-212 -without a single Republican voting in favour. But Obamacare eventually extended coverage to millions of uninsured Americans and prohibited insurance company practices such as denying coverage to people with preexisting medical problems. From 2010 millions of Americans, for the first time, were required to carry health insurance - through an employer, a government programme or by buying it for themselves; those who refused faced penalties from the Internal Revenue Service. In addition, tax credits to help pay for premiums started flowing to middle-class working families with incomes of up to $88,000 a year, and Medicaid was expanded to cover more low-income people. But in walked new belligerent President Donald Trump with a promise to replace Obamacare with "something better" and cheaper but he could not explain to the American people what exactly he was proposing. Last week House Republican leaders, facing a revolt among conservatives and moderates in their ranks, pulled legislation to repeal the Affordable Care Act (Obamacare) from consideration on the House; it was a major defeat for President Trump on the first legislative showdown of his weeks-old presidency. The New York Times said last week the failure of the Republicans' three-month blitz to repeal President Barack Obama's signature domestic achievement exposed deep divisions in the Republican Party. In our view, it also demonstrated that national health care insurance is an extremely complex and expensive endeavor even for the most prosperous and powerful nation on earth. While Dominicans witness the acrimonious debate, between Republicans and Democrats on CNN and the other networks, we must not fail to relate the debate to the Dominica context. Recall that the Dominica Labour Party Government of Roosevelt Skerrit promised, in its 2005 Manifesto (at page 24), "to establish a National Health Insurance System to provide health insurance and coverage to the public." Obviously, the government failed to fulfill that promise because there's has been no national health insurance scheme up to today. But 12 years later, with funds from the Citizenship by Investment (CBI) programme Government has introduced a pilot programme that is expected to be launched officially today Monday 3 April. At that function we hope to hear how the system will function and, most importantly, we hope to observe whether there is a plan for the establishment of a complete national health insurance scheme. Undoubtedly a national health insurance scheme is absolutely necessary because of the rising cost of health-care, the increasing prevalence of non-communicable diseases such as diabetes, and changes in the structure of the population. People are now living longer and the population is getting older. But the problem for most governments, including the government of the United States, has always been how to fund a national health insurance scheme. Republican of the United States hated Obamacare because the system taxed the richest one percent of the population to pay for insurance for the poor and disadvantaged; they contemptuously called it socialism. In the Caribbean the issue of funding health care has not been easier. 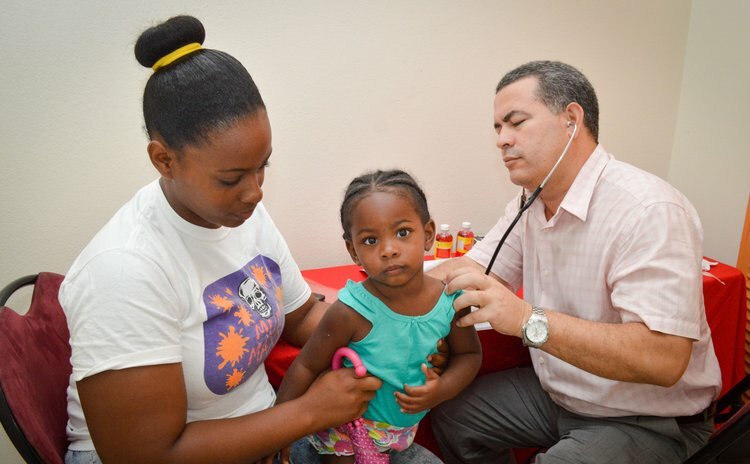 An International Monetary Fund (IMF) Working Paper titled "Universal Health Care 101: Lessons for the Eastern Caribbean and Beyond" suggests that health care plans should be part of the government's medium and long-term strategy and health plan's cost should be incorporated into the medium-term expenditure framework, so as to ensure the current and future financial viability. The IMF paper recommends two ways of financing universal health care insurance. The first is general taxation and the second is mandatory payroll or social security contributions. Reliance on external funding is definitely not an option, the paper argues, because that level of funding has disappeared and the sustainability of any health system cannot be based on the generosity of donors. In other words, Dominicans should not expect Venezuela or China to fund a universal health care system. But what government would risk the outrage of the public by imposing new taxes on an already severely over taxed population? Using social security contributions is a more palatable option but officials of the Dominica Social Security will probably argue that since almost 40 percent of the population is unemployed, the additional burden of health care should not be placed on the shoulders of the few persons who pay social security contributions. In any case, the DSS is struggling to remain viable in the face of mass migration of the productive labour force and the draining impact of an ageing population. It seems obvious, therefore, that small, resource-poor countries like Dominica, operating individually, will find it difficult to offer comprehensive and sustainable universal health care insurance to its people. But it must be done. Hence, it has been suggested that these islands should pool their resources and create an OECS health insurance scheme. Some analysts have even suggested a scheme which would incorporate the more developed islands of the Caribbean, such as Trinidad and Tobago, Jamaica and Guyana. In other words, the implementation of a CARICOM health insurance scheme should not be beyond the dreams of our regional leaders. Maybe they would need that Obama-like spirit, refusing to scale back their aspirations or fall prey to fear.